Born: 10 Nov 1883, Surrey Hills, Sydney, NSW. Enlistment Date: 30 Dec 1915, Liverpool, NSW. Fate: KIA 20 Sep 1917, Ypres, Flanders, Belgium. 33yrs. ​ Australian War Memorial, Canberra; & Yeoval, NSW. Private William Joseph Bird is not listed on Cumnock’s plaque honouring those who served in the Cumnock District during WW1, 1914-1918. He was recently added to the Yeoval WW1 Roll of Honor with relatives attending the 2015 Anzac Commemoration Day at Yeoval. William (Billy) Joseph Bird was born on 10 Nov 1883 at Surry Hills, Sydney, the son of Sarah and Frederick Joseph Bird. A sister, Alice, was born in 1885. Frederick Bird died on 21 Nov 1885, at Paddington, Sydney, just 25yrs old, leaving his wife Sarah with two young children to raise. Their mother Sarah also died young at 36yrs of age, on 11 Apr 1893. William would have been 9yrs of age at the time. He was then adopted and raised by his Aunt Jane (Jennie) Mason of Petersham, who was an elder sister of Frederick Bird. Further local newspaper reports give more details on William’s time in Cumnock. On the 26 Jun 1912, a meeting was held in Leary’s Hall to form a rifle club in Cumnock and William was appointed as secretary. During July 1912 he supplied a pendant presented to Mr H J Dyce, the founder and conductor of the Cumnock Brass Band, at a farewell for him at Leary’s Hall. William was then the local agent for Messrs. Angus and Coote, Sydney. 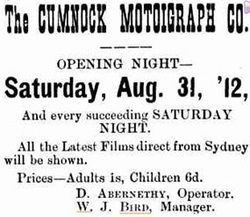 The Cumnock Motoigraph Co. later showed pictures at Yeoval, Baldry, Manildra and Molong.William sold his stationery and fancy goods business at Cumnock in August 1912 to Mr J Barter. He is reported in November and December 1912 as playing Billiards at Hogan’s Royal Saloon. In the Molong Argus - 25 April 1913, p3, it was reported that Mr W J Bird was managing the Beehive Store, Cumnock, for Mr N Lentz, who was on holiday in Sydney. William became involved in the Yeoval community from early 1914 and became a correspondent for the Molong Argus. As well as being manager of the Brockless Pictures in Yeoval, he also continued to show pictures at Leary’s Hall in Cumnock. In August 1914 he attended a meeting of the Yeoval Farmers & Settlers Association and jointly made a motion “that a letter be written to the Amaroo Shire Council asking that a washaway on the road at Buckinbah gate be repaired, as it was a menace to traffic.” On 6 Nov 1914, William was reported in the Molong Argus as having taken over the billiard room and hairdressing saloon at the Royal Hotel, Cumnock, but was having trouble finding a barber. The next newspaper report about William is from the Mudgee Guardian & North-Western Representative – 23 Dec 1915, p22, under the heading ‘Mundooran Recruits’, where it was reported that WJ Bird was one six men to step up to recruit at a recruitment meeting held at Mundooran on 18 Dec 1915. William was at that time working as a Station Overseer for Mr W Hoskins, Marran Station, Mundooran [Mendooran]. William Bird enlisted in the AIF on 30 Dec 1915, stating that he had been previously refused due to sore feet. He took his oath of allegiance at Casula, NSW, on 20 Jan 1916. His medical report stated he was 31yrs 2 mths old (he was actually 32yrs old), 5 foot 7 inches tall, with dark complexion, brown eyes, black hair and was of the Church of England religious denomination. He was transferred to the 20th Btn on 8 Feb and attended a Signal School from 2 Feb-1 May 1916. Pte Bird embarked from Sydney on 5 Jul 1916, on HMAT Ajana A31, disembarking at Plymouth on 31 Aug 1916. He proceeded to France on 19 Nov 1916, and on 11 Dec 1916 joined the 20th Btn at Coisy, 8 km north of Amiens, where the Btn was resting and training. Just four days later, on the 15 Dec, he became sick with Rheumatism (William had a past history of Rheumatic Fever) and Myalgia (pain in one or more muscles) and subsequently required to be transferred to a military hospital in Guildford, England, for treatment. Following discharge from hospital he spent some time with No. 2 and No. 3 Command Depots, at Weymouth and Hurdcott respectively. 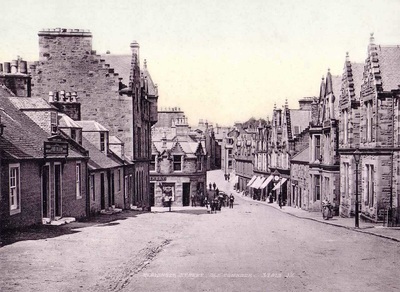 “One of our localites recently received a paper from Scotland, ‘The Cumnock Chronicle,’ wherein was stated that Private Billy Bird, one of our local soldier lads, was entertained at a banquet by the Mayor and Aldermen. Billy being the first soldier from Cumnock, NSW, to visit Cumnock, Scotland, was given a hearty welcome. After the usual toasts were honored, etc, on rising to respond Billy said he was proud to be a native of Australia, and spoke well of our little town of Cumnock, mentioning several names of our prominent men. Private Bird, who had been in the trenches doing his bit, came through without a scratch, and was over taking a well earned rest. Good luck, Billy! Pte Bird had actually spent very little time in the trenches during his service so far, but he returned to France and rejoined as a Signaller of ‘D’ Coy, 20th Btn, on 25 Jun 1917. The Btn was attached to the 5th Brigade, 2nd Division. According to the 20th Btn’s War Diary (www.awm.gov.au) the company was then resting and training at Biefvillers-lès-Bapaume, a small farming village near Bapaume, in Northern France. They stayed at Biefvillers through July, and marched onto Arques, Northern France, in August. On 12 Sep the 20th Btn marched to Steenvoorde, and the following day onto Dickebusche, a village in the Ypres Salient, Belgium, behind the front lines. 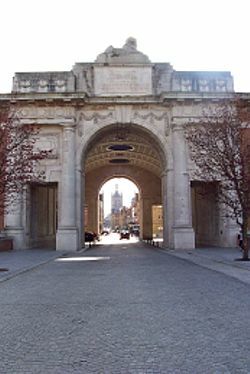 On the 18 Sep the 20th Btn moved into the walls of Ypres and final preparations for an attack began for the Battle of Menin Road. At 5pm on the 19 Sep, the 20th Btn moved forward and attacked the German lines. At 5.40am on 20 Sep, after 5 days of bombardment, 11 divisions of the 2nd and 5th British Expeditionary Force armies struck the Germans on a 13km front. The Australian 1st and 2nd Divisions, along with a Scottish Division, were the centre of the assault along Westhoek Ridge facing Glencorse Wood, with a combined front of 1800 metres. It was the first occasion in the war in which two Australian Divisions attacked side by side. By noon, the Australians had taken all objectives and were at the western end of Polygon Wood. Pte William Bird was killed in action on 20 Sep 1917, aged 33 years. His body was not found and his name is etched on the Hall of Memory inside the Menin Gate Memorial, Ypres, Flanders, Belgium. His Aunt, Jenny Mason, received his British War and Victory Medals and Memorial Scroll. “Quite a gloom was cast over the town on Saturday last, when word was received that another brave young soldier had met his death in the person of Private W Bird, who was killed in action Sep 20th. late ‘D’ Company, 20th Battalion. R.I.P. He was one of the best of our land. He died as he lived – a man. © Peter Tremain (Yeoval), Dianne Strahan & Val McKenzie (Cumnock), November 2015. The Molong Argus - 2 Aug 1912, p7. Molong Express & Western District Advertiser - 24 Aug 1912, p10.